Exploding demand - and no regulation has created a sober home industry that is a "Wild West" for people seeking help. Insiders tell NBC Bay Area that the sober living business is in desperate need of oversight. "I think there does need to be some sort of regulation," said Doug Casper, owner and CEO of Shine A Light, a company that operates five sober homes in Marin County. “There's no shortage of addicts and alcoholics. It’s the only industry where you could just open up ... and you have a business -- a turnkey business -- that's making a profit in two months. It's unheard of." After getting treatment for drug addiction, sober homes are places, usually single-family homes, people can live together and support each other’s efforts to quit drugs and alcohol. A National Institutes of Health study found alcohol- and drug-free homes helped people quit their addictions. But there’s no government oversight, no inspection, no licensing at all in California. State regulators can only estimate how many sober homes there are in California at the moment -- about 2,250. They charge anywhere from $450 a month to $10,000 or more, according to Recovery First, a web resource for people seeking sober living. "There's a lot of people out there try to do good, and sometimes they miss the mark, and there's other people out there sometimes just want to exploit people," Casper said. Peter Miles has battled alcoholism for decades, and he was looking for a sober living home in the South Bay. He wound up in the United States Mission in San Jose, which states on its website: "Our purpose is to provide our residents with a long term clean and sober home with quality meals and a self-help work program that provides each person with the opportunity of turning their lives around." But Miles says he felt the sober home was more focused on raising money than helping residents stay sober. He says he and about a dozen other residents were loaded into a van and dropped off in neighborhoods across Santa Clara County to knock on doors six hours a day, six days a week, to ask for donations. "You go to the door and say, ‘My name is Peter Miles, I’m out here helping homeless veterans like myself.' People hear that veteran thing, and they give you all kinds of money," he said. Miles says he was the only veteran at the San Jose home. He admits he kept drinking while he was at the home, but as long as he brought in the money, he says they looked the other way. "We are a religious nonprofit organization," said Patricia Martin, the administrator of the San Jose branch of United States Mission, which also has homes in Southern California, Sacramento, Portland, Oregon, and Seattle. Martin refutes Miles’ claims. "We do drug testing and breathalyzing," she said. When asked how often those tests happen, she said, "We don’t have a scheduled thing -- but we do it at random." Martin says she gave Miles multiple chances to return to the home after he relapsed and eventually asked him to leave. And, she says, unlike other sober homes, no one has to pay to stay. Residents are given 10 to 50 percent of what they raise, based on what they bring in. Martin estimates the home takes in $20,000 a month from street donations. When asked where the rest of the money goes, Martin said, "It pays for the food. It pays for the utilities, you know, (it) pays for the vehicle." The U.S. Mission is registered with the IRS as a religious nonprofit, which means it doesn’t have to pay taxes. When asked about what makes the organization religious, Martin said, "The guys go to their church of choice here. They say a prayer before they go out." Brian Jones is secretary general of United States Mission, and he oversees all six of its homes on the West Coast. "It is too bad that a disgruntled former member could generate such animus against us and the work we do," Jones said. The door to door fundraising, he said, is "an act of religious worship called religious solicitation." "I’ve never heard of anything like that. I don't know what model that is," said Craig Koury, the membership manager of CCAPP, the California Consortium of Addiction Programs and Professionals. His group offers certification for sober homes, which is based on safety issues like fire extinguishers, smoke alarms and clearly marked exits. "We think that we're moving everything at least in the right direction," Koury aid. "We have inspectors up and down the whole state." 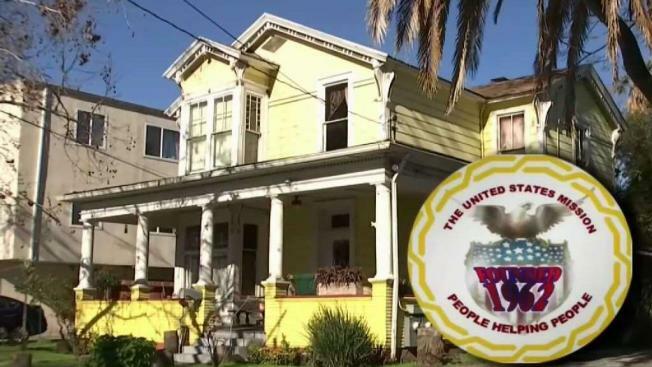 CCAPP certifies about 400 sober homes, out of an estimated 2,250 in California. A similar group, the Sober Living Network certifies about 400 more homes. That leaves about two-thirds of all sober living homes without any oversight whatsoever. And even if a sober home is certified by one of those two groups, that does not guarantee it’s doing a good job of helping residents get sober. "You don't know you have a sober house if nobody's being tested," said Casper of Shine A Light. He said the company used to pay the $195 annual fee to CCAPP for certification but stopped in 2016, deciding his company’s standards went even further than CCAPP’s. For Casper, drug testing, which is not required by CCAPP, is an essential part of running a sober home. Casper says Shine A Light conducts daily drug testing the first six weeks after a person checks in, then random testing three times a week after that. "There's drug dealers open 24/7 and different parts of the Bay Area. There's liquor stores open from 6 a.m. to 2 a.m.," Casper said. "If we can limit as many of these opportunities that people have in early recovery, it gives them a chance to stay focused." To do that, he says he limits access to money, wallets and car keys. For Miles, the search for a sober living in the South Bay continues. "My sobriety was important," he said. "I just didn't feel right with the situation." Since 1999, there have been 25 bills introduced in California to regulate sober homes. None has been signed into law. A 2016 state government report outlines the challenges to enacting regulations and makes policy recommendations.